mastered Skype, and the calls were heartwarming and hilarious usually with a backdrop of family,Club members, or Huancarani weavers. 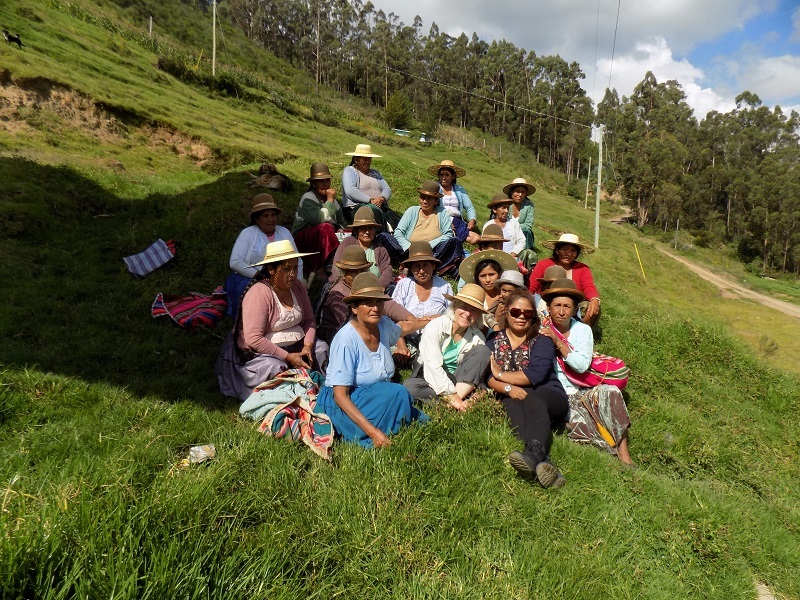 In mid- December, the weavers of Huancarani took a break from spring farming activities to attend the annual meeting of the Centro de Artesanía, Huancarani (CAH). The gathering also includes a feast prepared in an outdoor wood burning adobe oven and the awarding of the Spinzillita prize due all participants of October´s local Spinning Week. 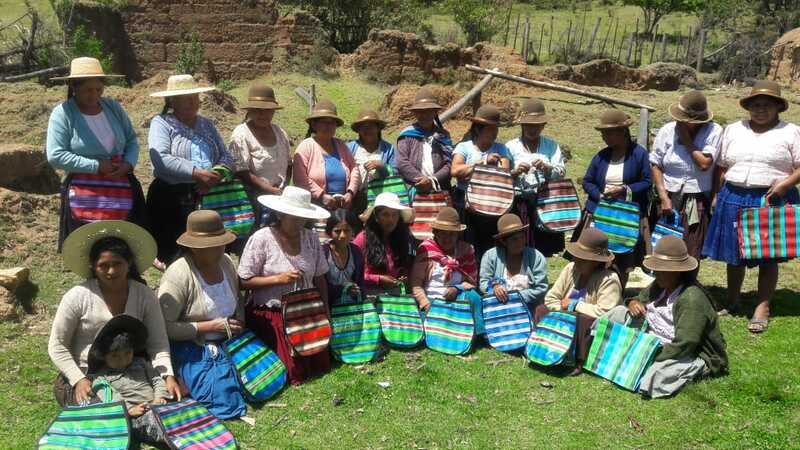 PAZA funds were used to purchase 25 reusable mesh shopping bags as prizes for this year´s registered participants. The team grew as unregistered spinners joined in during Spinning Week. Doña Maxima, team captain, worked with her team to figure out how to award the additional participants. The registered spinners chipped in to buy extra prizes so all who participated would be recognized for their skill. Although rarely seen in the hands of city dwellers, a rural woman´s ensemble would seem to be missing something without a mesh bag in hand. 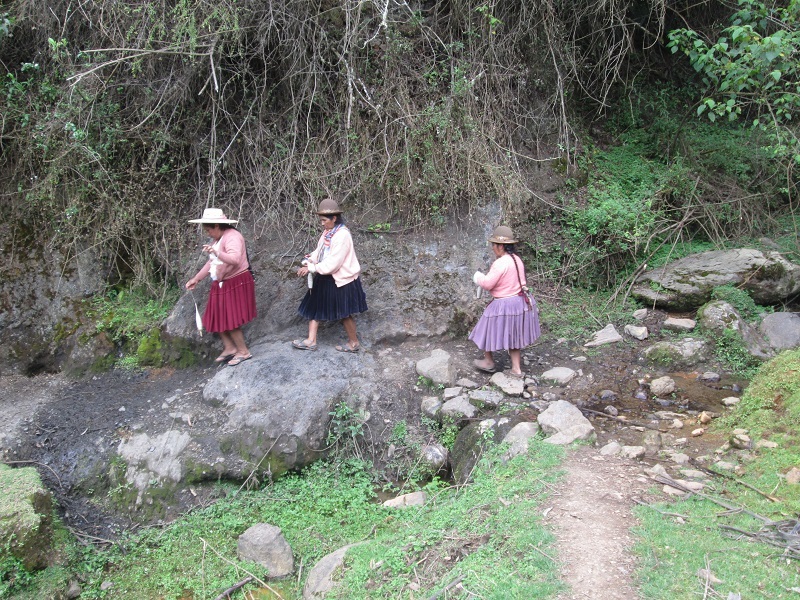 The bags have largely replaced the hand woven incuñas (squares) formerly used to wrap cargo for carrying in aguayos. 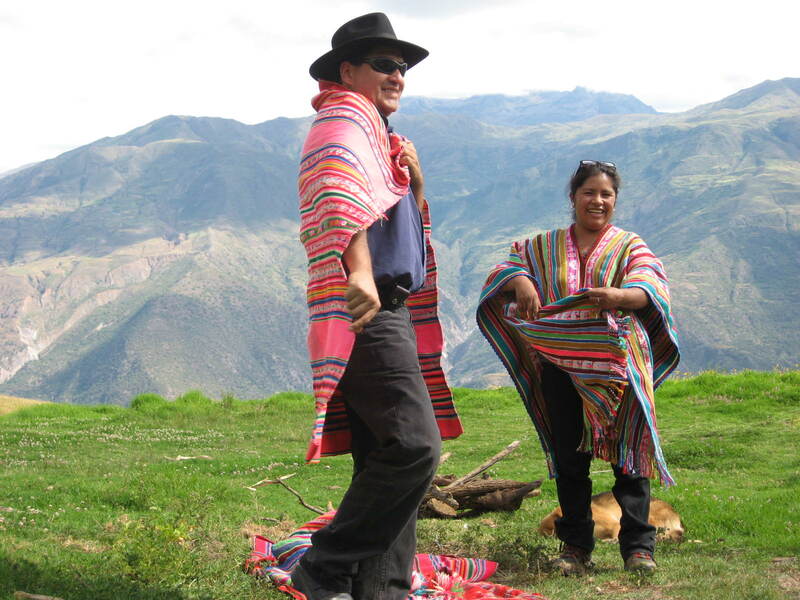 Aguayos, the Andean backpack consisting of 1 piece of cloth if machine woven, and 2 pieces of cloth if handwoven, are still very much in use. The incuñas were organic, the mesh bags are plastic, but reusable, and alas, vendors’ use of disposable plastic bags is increasing. During the CAH annual meeting, the weavers voted to not raise weaving prices for 2019. 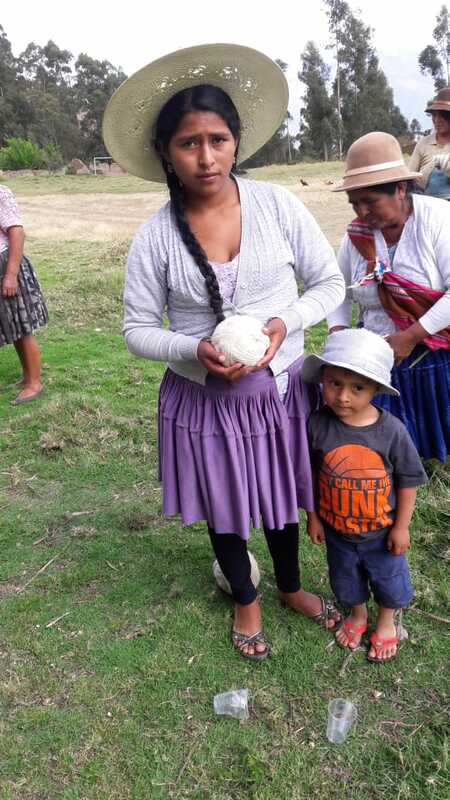 A PAZA weaving order was sent in October, but lacked transportation to the U.S. until a former Peace Corps volunteer and her Bolivian husband made space in their luggage among what they had to stow for themselves and their 2 young sons. Thank you Claire and Beto for going above and beyond! The newly arrived fajas ($38) and zippered bags ($16/$17) are available for sale. There are also a lot of yoga mat straps ($22/$23), which are no longer in production. Send inquiries to dkdutcher@hotmail.com. In November, Laverne Waddington, placed her annual order of fajas (bands) which she uses in her weaving workshops. We’re still waiting for her annual quality report which is accompanied by photos if there are errors. 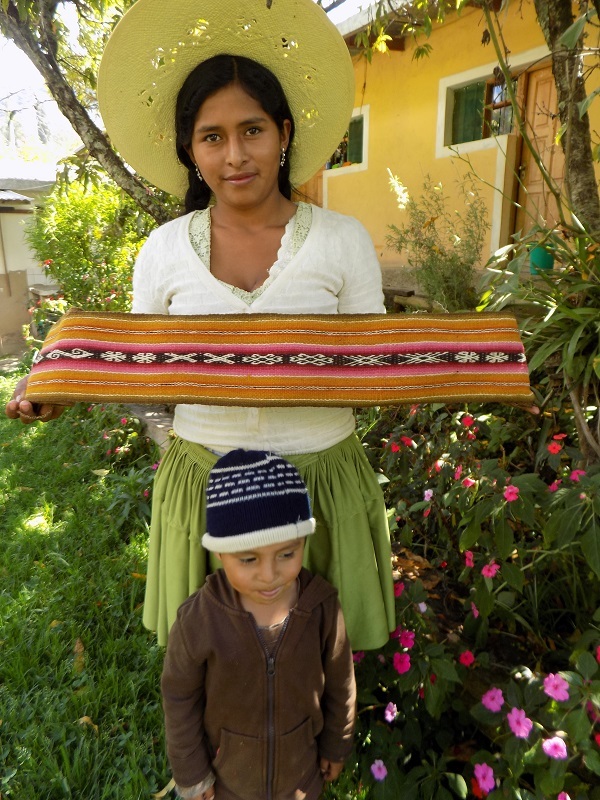 Laverne’s weaving students purchase the majority of the PAZA orders and as weavers themselves their 2018 feedback in photos helped Doña Maxima with the quality control. She has difficulty rejecting a weaving and denying payment to an elder. Prior to April, she’d ask Dorinda to convey the bad news. the team. The spinners of the community of Sanipaya were miffed when the budget was cut to include them in 2018. Are we still on in this together? The weavers and Club members are carrying on, Dorinda continues to commit time and travel expenses, but you need to decide as to whether or not you will continue to financially support PAZA. Last year’s expenses totaled $4,092. The 15 donations received totaled $1,221. There is just $1,344 remaining in the general operating fund. The quarterly activity fund of $820 was wired to Doña Maxima this month. Her salary was increased $3 to $21.60/day to reflect her increased responsibilities as the Club de Artesanas trainer and PAZA. The unofficial Spinzillita Spinning Week in Independencia, Bolivia went off without a hitch. It is the 5th year the rural weavers have spent the first week in October spinning and eyeballing each other’s progress. For lack of a TNNA Spinzilla sponsor they could not officially compete. Mid-week Doña Maxima contracted a vehicle for the ride winding up the mountain west of Independencia, along the ridge top, and halfway down another mountain into Huancarani. 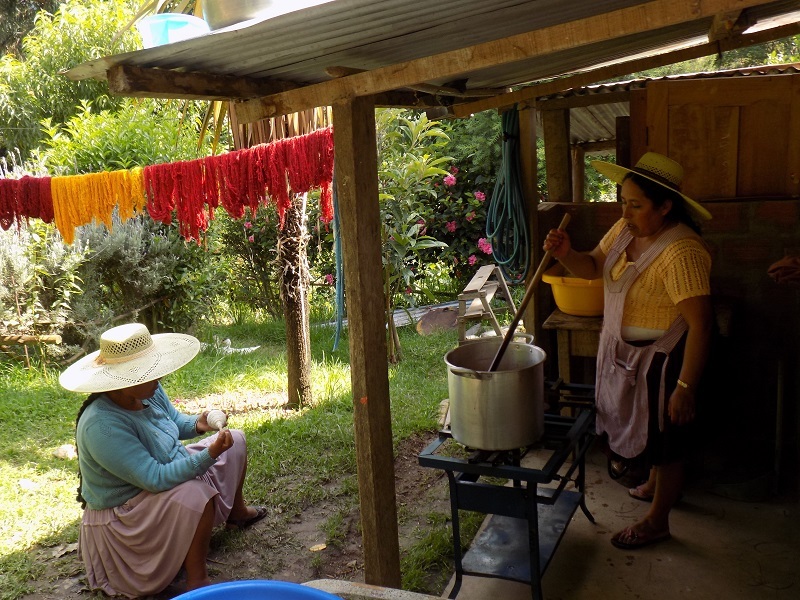 Doña Justina had the 19 participants in that community organized for a photo shoot and evaluation of the yarn spun thus far. Being dry season, the rough track that serves as a road to farmsteads to the west was passable. 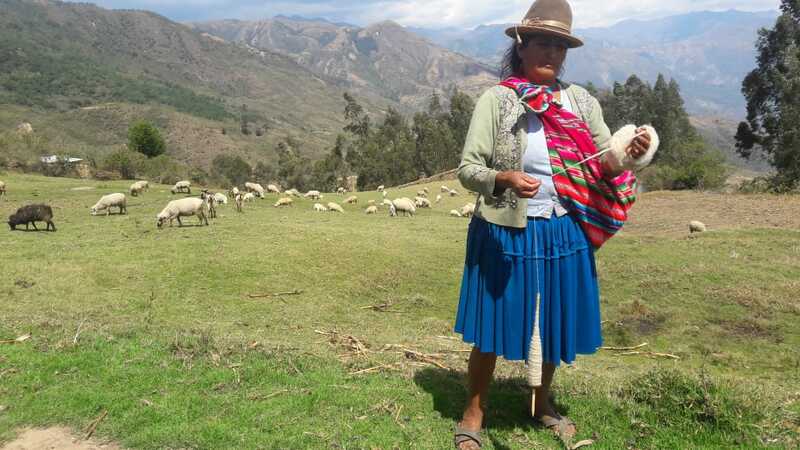 A stop was made near the farmstead of Doña Narciza, Doña Maxima´s only sibling still residing in Huancarani, who was out and about with her goat herd. Backtracking to the central part of Huancarani, a large group of spinners were waiting at the soccer field. Spinning and chatting the group headed uphill together in search of Doña Toribia who was in a large meadow, and perfect picnic spot, spinning and watching over her flock of sheep. 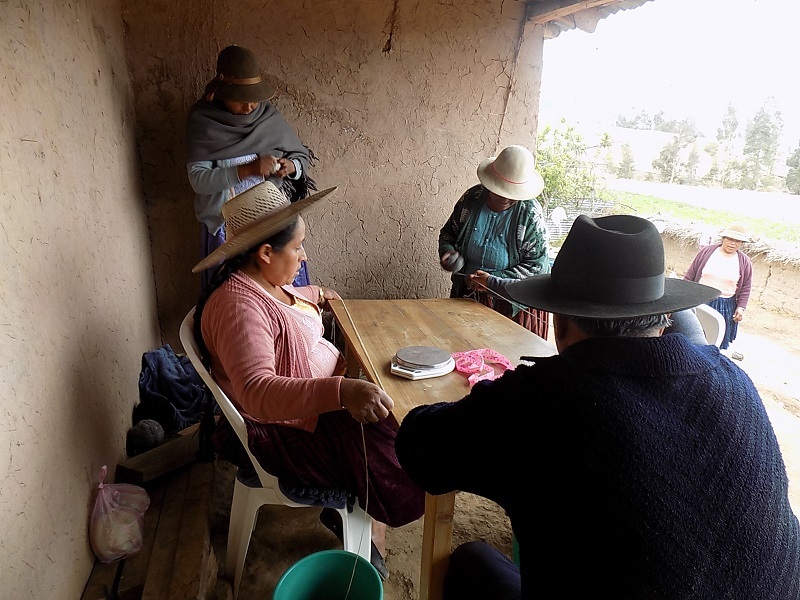 On Monday, the day following the end of Spinning Week, Doña Maxima, Doña Antonia, and Vilma made the trip to Huancarani to measure the yarn spun. PAZA paid a wage to the latter 2 because help was needed for measuring. In the past, PAZA volunteers were on hand to help with the wearisome task of measuring out yard after yard of 2 ply yarn between 2 marks on a wooden table. Although the enthusiasm for Spinning Week has grown, the results were the lowest in 5 years. In 2017, the Cloth Roads team Warmi Phuskadoras last official participation in Spinzilla resulted in 70,390 yards spun on drop spindles placing them in 27th place out of 70 teams. This year the yarn spun dropped to 54,524 yards, which would have placed them in the 24th place out of Spinzilla´s 38 official teams. Doña Maxima´s norm was well below past years because of travel days. She was probably exhausted as well because Spinning Week began the day after her daughter´s 3 day wedding and celebration in Cochabamba. She was 100% in charge during Wednesday´s all day trip to Huancarani which meant more work for her and less time to spin. This is the first blog posting where she is credited with the photos. Doña Casimira had her 3rd win by spinning 3,852 yards. There were 3 first time competitors, all young! Maribel, who was spinning in her second competition, beat Doña Maxima. When it comes to hand spinning, it is the elder women who place highest. Their skill will be recognized and celebrated at their December 19th meeting and feast. The prize this year is a mesh shopping bag. By strict adherence to the Spinzilla rules, the event has offered the women opportunity to learn to problem solve and to work together as a team. This year 4 unregistered spinners did spin during Spinning Week. During a Skype call with PAZA, Doña Maxima asked 3 different ways if it was possible to get around the registration deadline to be able to give the unregistered spinners a prize. One of the spinners is her mother-in-law, who she prefers not to upset. Registration closed the end of July, the rules can’t be changed, and the PAZA budget is fixed. The PAZA suggestion was to ask the registered spinners to take up a collection to purchase mesh bags for the 4 extra participants, especially since they paid no participation fee as in years past. The spinners say they are accustomed to Spinning Week and would be disappointed if it is cancelled. PAZA has not found a 2019 TNNA sponsor, and with the decline in participation in Spinzilla this year, its future seems uncertain. However, PAZA hopes to find a way to help the spinners carry on the Spinning Week tradition and celebration of their spinning skill. The key word is “tradition” these women are the last generations to live the ancient farmer subsistence lifestyle that intertwines spinning and weaving with self-identity. The Bolivian Warmis Phuskadoras Spinzilla spinning team has not lost their enthusiasm for Spinning Week although they will not be competing in the The National Needle Arts Association (TNNA) event this year. PAZA and Doña Máxima, Team Captain, have organized a local event. Registration took place during the month of August and 29 spinners signed up. Between now and October 1, the 1st day of Spinning Week, the spinners will be preparing fleece for spinning as there is no roving locally available for purchase. That prep process is labor intensive and includes wheelbarrows and the Palca River, click here to link to last year’s tale. The spinning event will involve contracting a vehicle on 2 different days for the trip to Huancarani, where 21 of the participants will be spinning. A trip mid-week gives the spinners an excuse to congregate, socialize, and eyeball each other´s progress. Since childhood, they have vied with one another in their spinning and weaving skills and that competitiveness hasn´t lessened a whit. Doña Maxima is tasked with photographing during these rare opportunities to capture images of the evanescent farmer subsistence lifestyle. 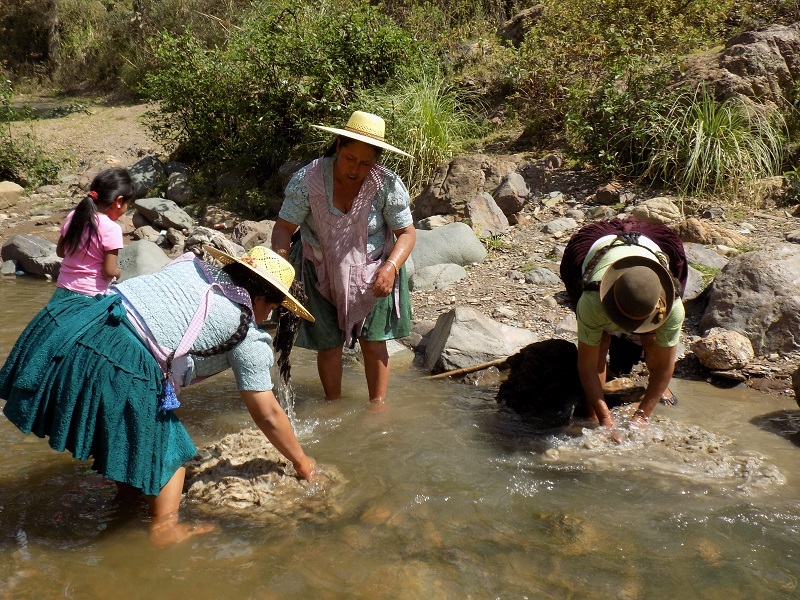 Monday, October 8th, will be Measuring Day and Doña Maxima will hire 2 folks to help with the exhausting job of measuring around 68,000 yards of yarn, one yard at a time. The spinners want every ball of yarn to be measured by the same method, so no niddy noddys or yarn counters can be used. orders. Doña Máxima related that she is impressed with the fineness of the straps they wove to fill their first PAZA order. She was overdue for apt weaving pupils, she has tried to teach many teens and women who have been in the Club and lacked the interest to get over the initial learning hump. As mentioned in the last posting, purchasing phuskas (drop spindles) in Independencia has become a problem since the last phuska maker died. Doña Maxima asked if phuskas were available for sale in Sanipaya. 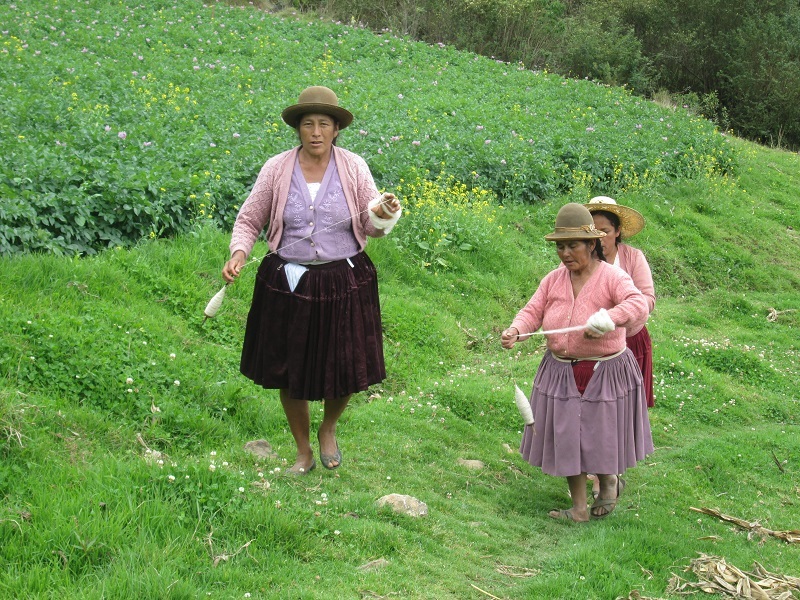 The spinners from Sanipaya responded no, that they buy phushkas in the city of Oruro when they go to visit family and sell their corn at the harvest fair which attracts vendors of all ilk. 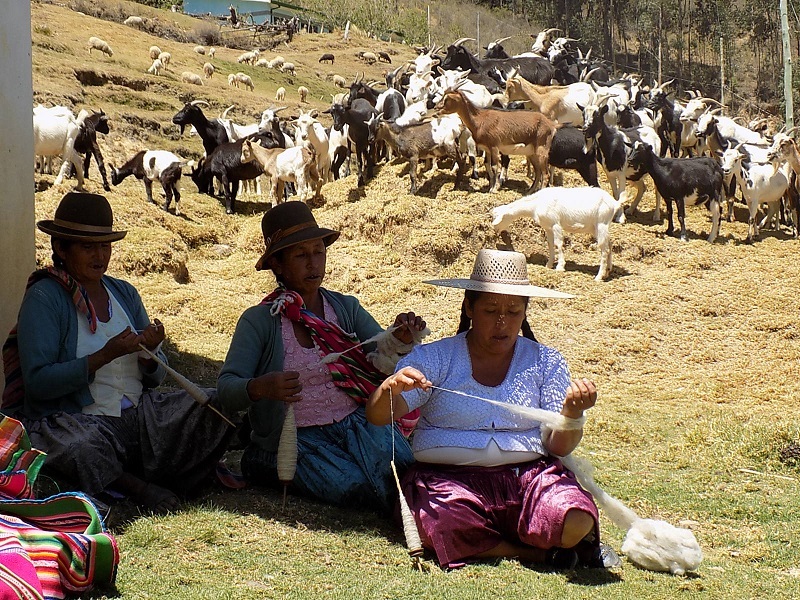 Fleece from highland Oruro is coveted by all the spinners because of the long fibers compared to the local sheep fiber. Doña Máxima will be hustling back from Cochabamba to be in time for the start of Spinning Week in Independencia. 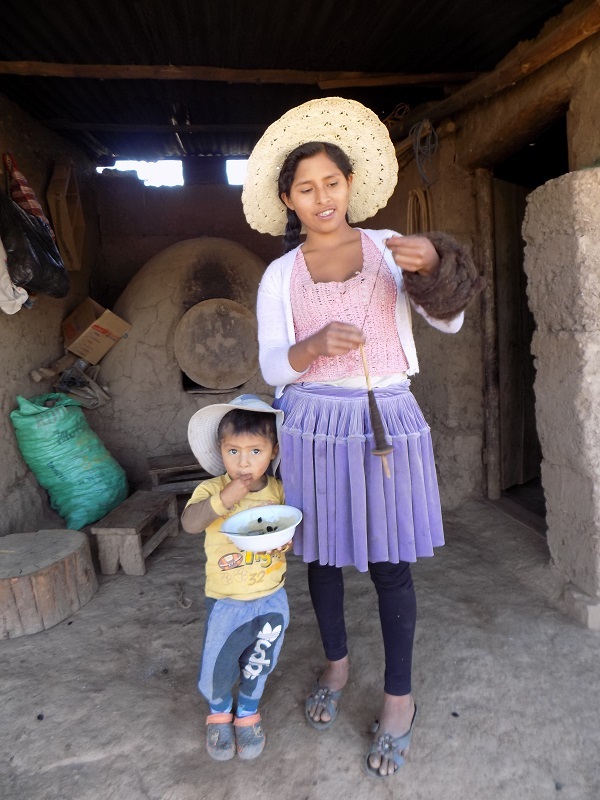 Most of you who have visited PAZA in Bolivia have met her daughter, Zoraida, who resides in Cochabamba with her family. Zoraida and Luis will be married on September 29th. In attendance will be their 10 year old daughter Zunilda and her 1 year old sister Luz Ariana. 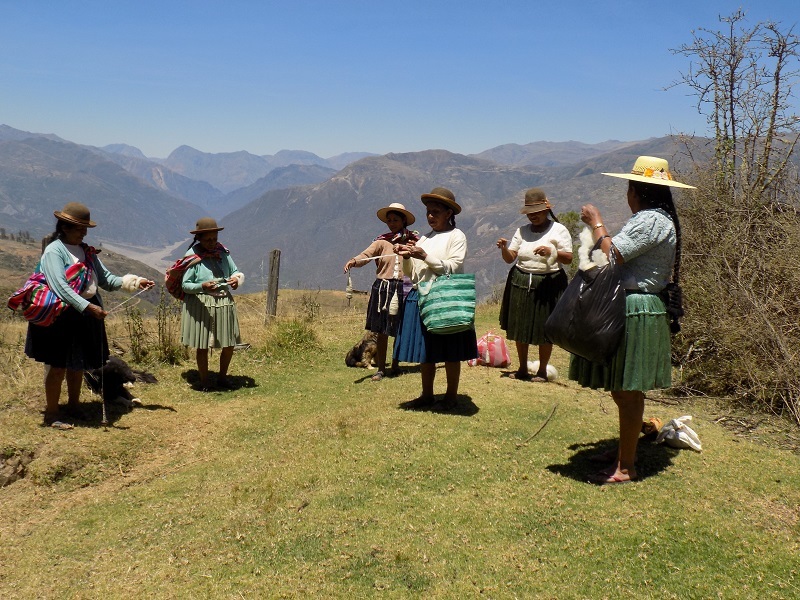 Marriage ceremonies for rural Bolivians usually take place years after a couple has started a family, simply because the expense involved in feting the community for 3 days isn´t a priority. Because they live in the city Zoraida was able to reduce their celebration to 2 days without raising eyebrows. 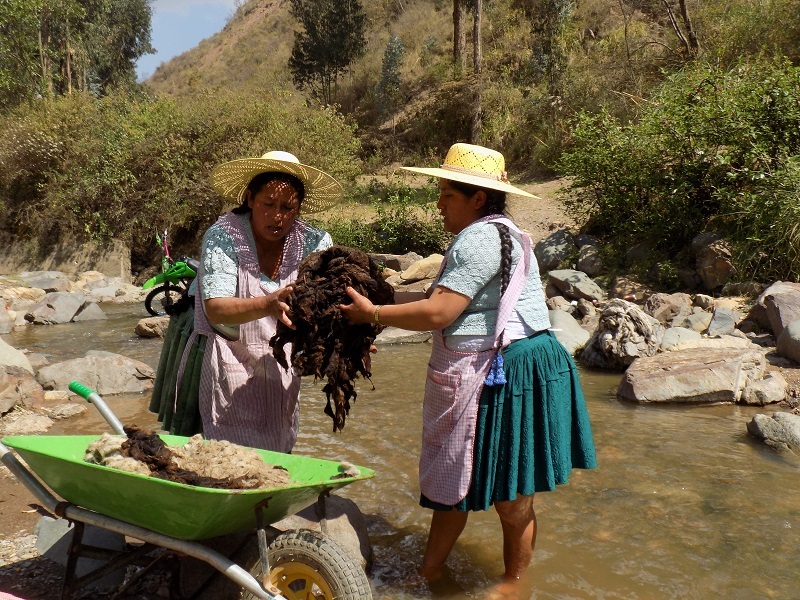 Zoraida weaves when she is in Independencia and has worked at all the PAZA sales activities in Cochabamba. What to do with no 2018 Spinzilla for the Bolivian team Warmis Phuskadoras? Spinzillita (“Little Spinzilla”) is the answer! Doña Maxima, who has been the team captain the past 4 years, mentioned in a Skype call to PAZA that the team would like to spin during Spinning Week. The social aspects of Spinzilla Spinning Week are important to the weavers and by participating they have had skeins ready for the dye pots when the dye plants become abundant a few months later during the rainy season. The participants who spin but no longer weave have yarn to sell, which PAZA and the producing weavers snap up. Going through the annual routine of registering the participants, spinning during Spinzilla Week, having photo day in Huancarani, and measuring the results is an excellent learning opportunity for all involved. It will be Doña Maxima´s first opportunity to be 100% in charge without PAZA´s direct influence. The rural spinners are all famers and because Spinning Week falls during a lull in the agricultural calendar they are in the habit of happily dedicating the week to spinning and socializing. 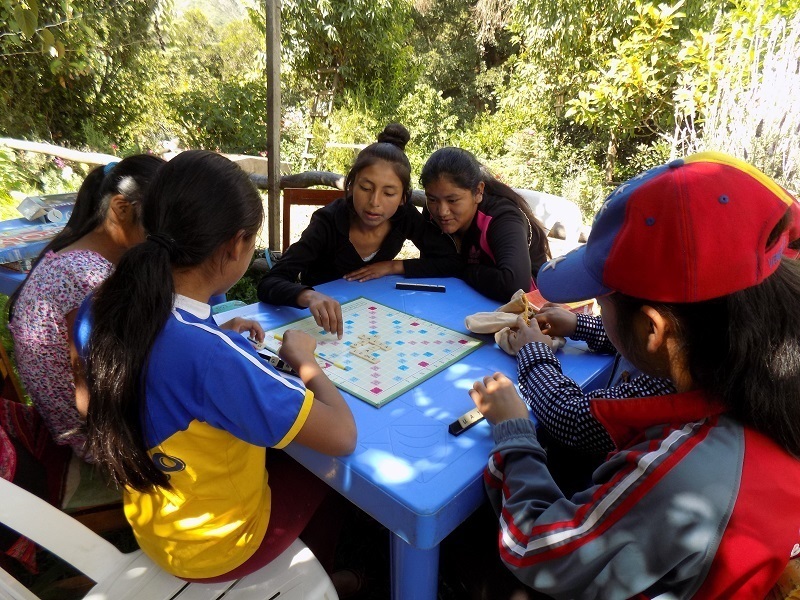 PAZA has estimated a budget of $400 for the local event, which includes 2 trips to Huancarani, extra wages, a trip to Cochabamba for Doña Maxima, and the annual prize for each participant. The budget for the annual prize will be between $3 and $5 per participant and one suggestion was for a mesh shopping bag. The prize is important as tangible recognition of the participants´ spinning skill and a reward for participating. PAZA is working on securing a sponsor for Spinzilla 2019, who will be able to send a representative to Independencia with Dorinda for 2019 Spinning Week. Spinzilla would feel more “international” to the weavers if they could meet and interact with their TNNA sponsor. There has to be a TNNA member out there whose sponsorship of the Bolivian team will enhance their business while speaking to its mission and values. Thanks, yet again, to Laverne Waddington who mentioned the weavings for sale on her blog, they literally flew out the door. All that is left in the U.S. inventory are more than 50 of the yoga mat straps and a few belts and guitar straps. 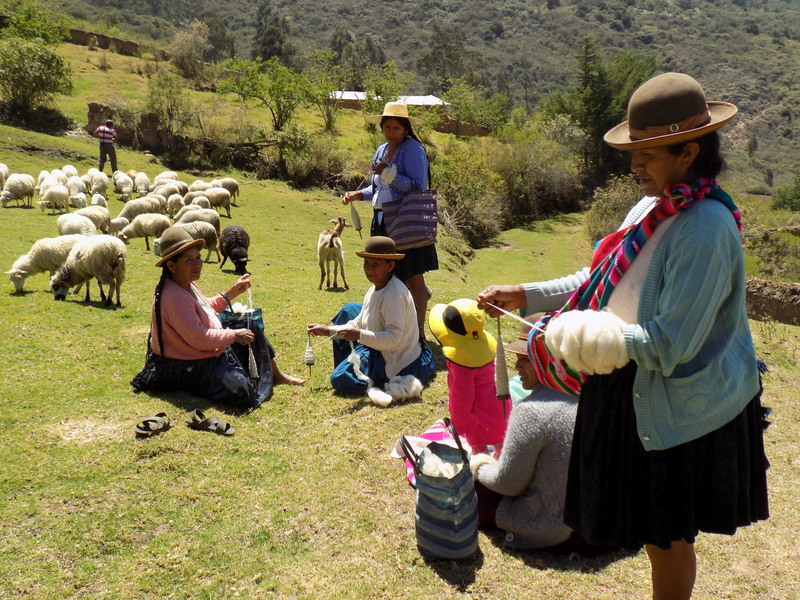 Over half of the sales funds received were returned to Bolivia yesterday along with the next weaving order. Getting the weavings from Bolivia to Bozeman is a work in progress, but hopefully something will work out in time for holiday shopping. 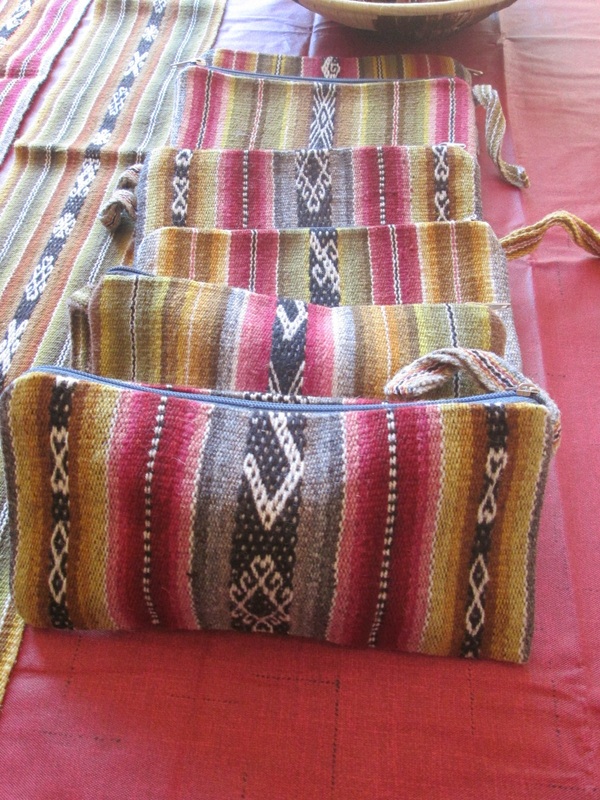 There will be another weaving order placed in January to ensure that the weavers have money to purchase school supplies when the academic year begins in February. 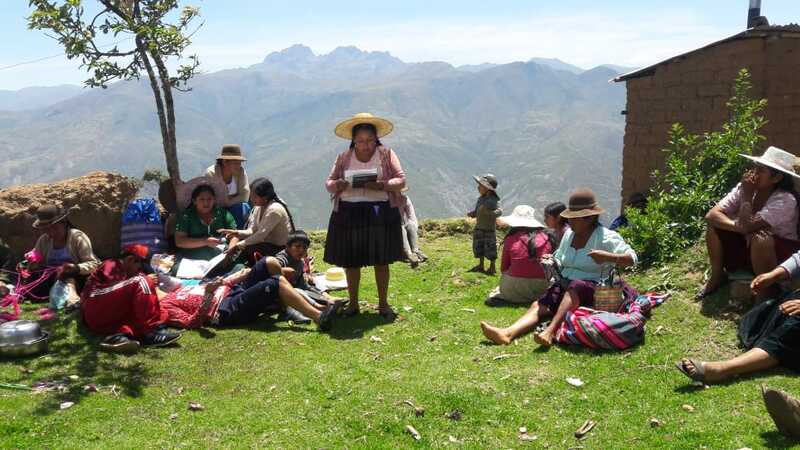 Doña Maxima continues to work on Tuesdays and Thursdays as the trainer for the Club de Artesanas. She has taught 2 young mothers in the neighborhood to weave. The Club members have been trying to draw locals into the PAZA store/workshop to purchase the bags made from cloth and backpack material they have been sewing to sell. They haven´t received many customers, but there is interest in the backpack design Vilma sewed and that her 8 year old daughter is carrying to school. 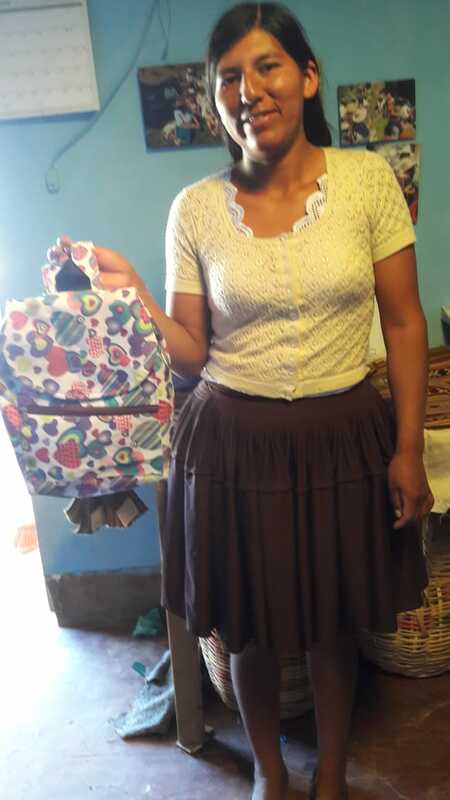 PAZA sent funds yesterday for the Club to purchase backpack material and sewing supplies so the women can sew and test designs. PAZA will continue to support the project for production of a few backpack designs for the next school year. The abysmal quality of the “made in China” children’s backpacks sold at the vendor stalls during market day is a crime against the mothers who are so challenged in finding the cash to pay for school supplies. 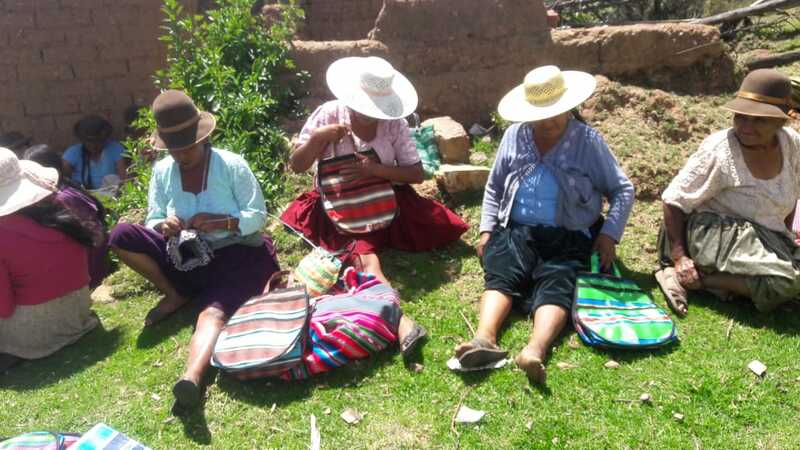 There should be a local market for quality locally made backpacks and pencil bags created by the Club mothers with their and their children´s needs in mind. Doña Maxima and the weavers in the Club de Artesanas (CdA) have been managing quite well since Dorinda’s departure from Independencia in mid-April. 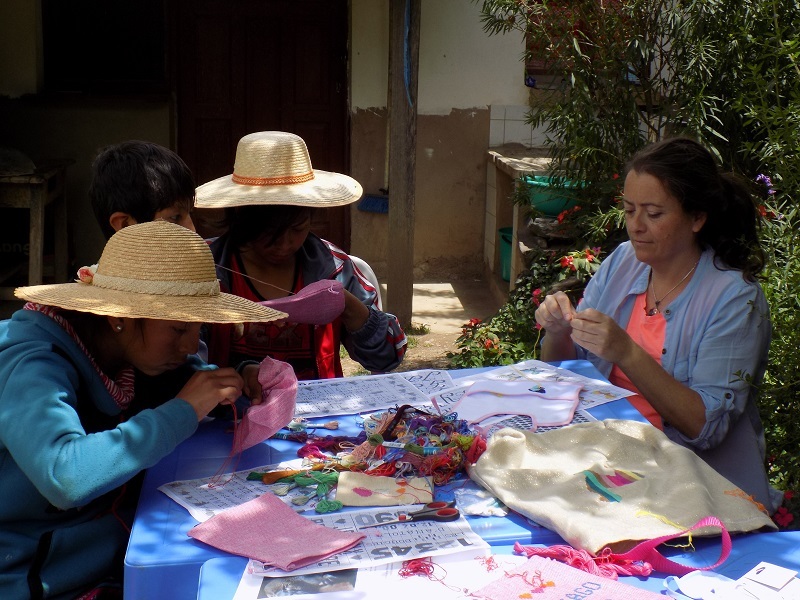 There was a flurry of activity prior to Independencia’s Feria de la Chirimoya (Harvest Fair) in May to make a variety of bags using material on which they’d cross-stitched or embroidered designs. That provided the Club´s vendor booth with some lower priced items alongside the traditional weavings for the local sales opportunity. 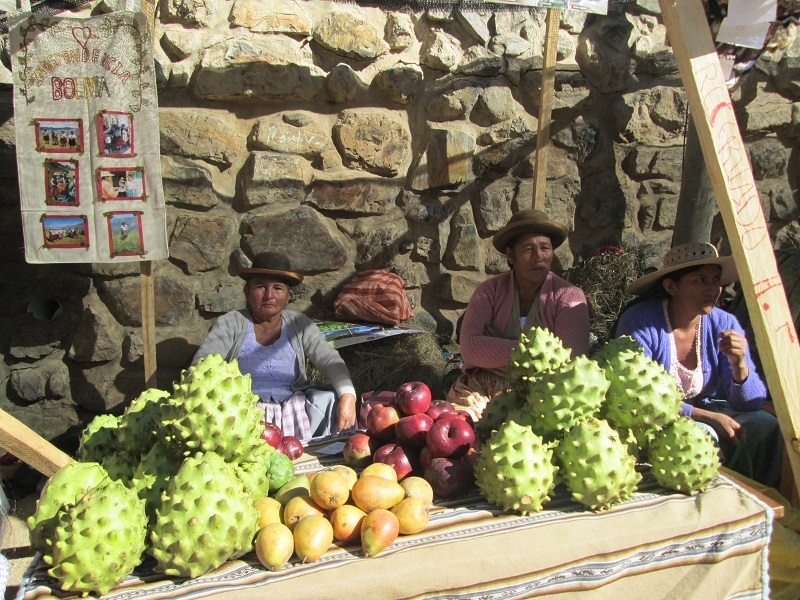 Many of the Huancarani weavers were in town to exhibit and sell their chirimoyas (apple custards), mandarins, and avocados for the judging. Although the fruit sold well, the bags and weavings did not. The women continue to meet all day Tuesdays and Thursdays in their new workshop/store. It is a good location, so the Feria gave them some exposure as to the variety of goods offered for sale. PAZA continues to pay Doña Maxima a half day salary for 2 days a week, but their routine is set so they meet for the full day. 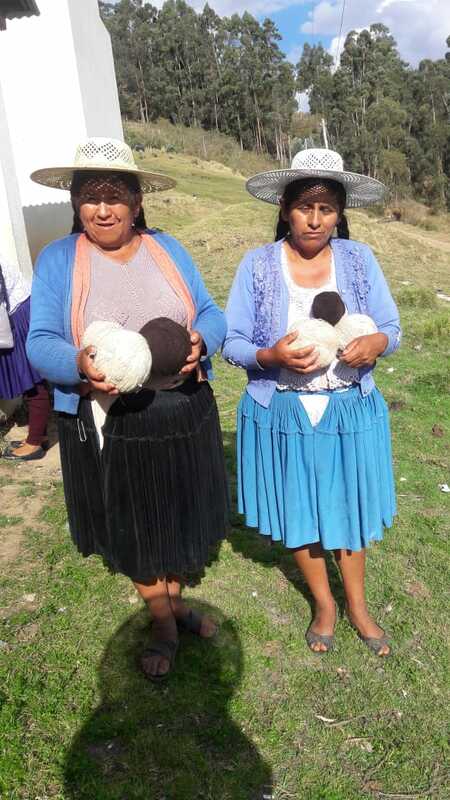 Two young mothers who recently moved into the new nearby neighborhood joined the Club, learned to weave, and are waiting for their first order. Their first orders will be for yoga mat straps until Doña Maxima determines that they are ready to move onto the larger weavings. The Huancarani weavers are feeling a sense of abandonment, so PAZA will place an order at the end of July to reassure them and to keep up the momentum that took so many years to build. Please HELP! 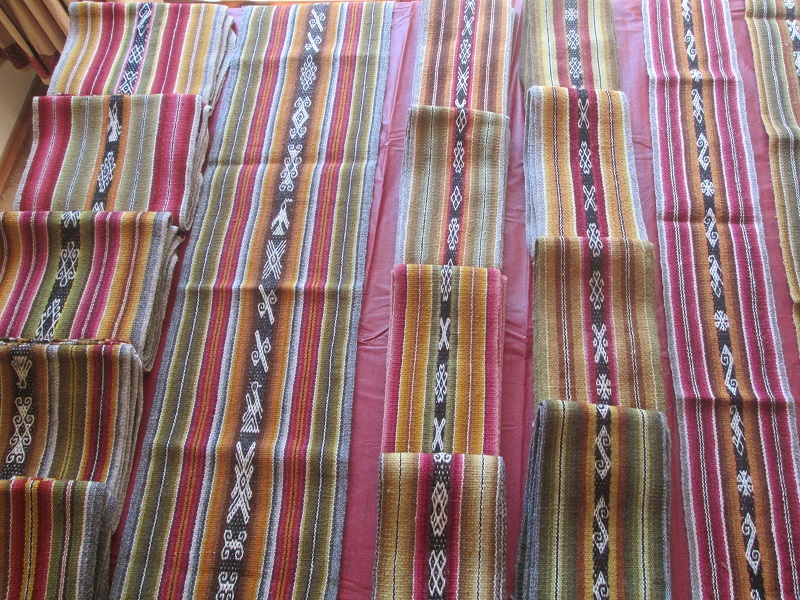 You can help PAZA by purchasing a weaving(s) from the U.S. inventory. That inventory is tying up 62% of PAZA´s revolving fund for the purchase of the weavings. 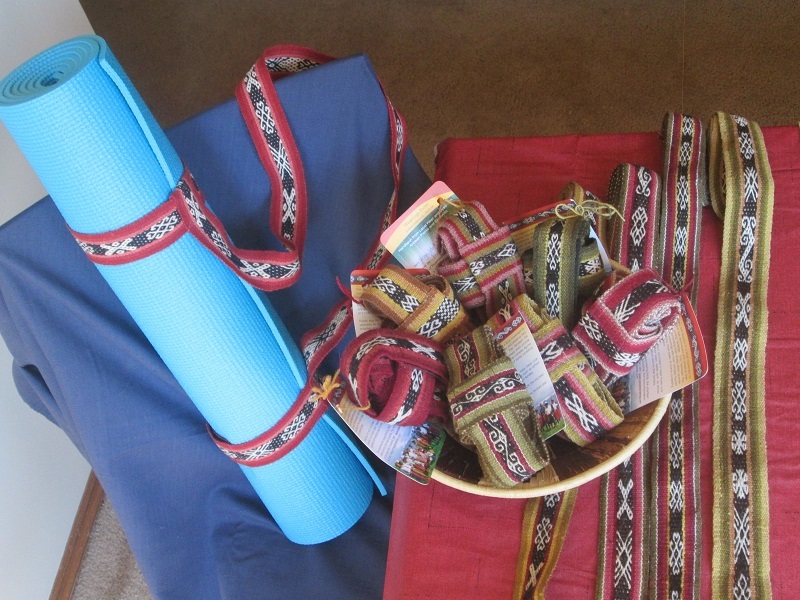 There are 67 yoga mat straps in stock, so if you attend yoga classes please consider purchasing one for yourself and a few to give as gifts or to sell to yoga practicing friends. Weaving a yoga mat strap is the entry level for new weavers to realize that they have learned a skill that will help them pay for the expenses of raising their children. 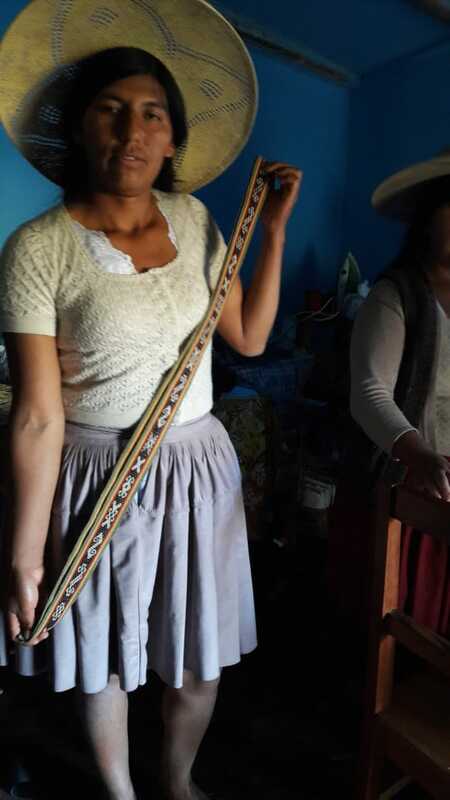 The sewing of the yoga mat straps pays Vilma, a single mother of 4, a per piece wage. The yoga mat straps are available in 2 sizes. The regular size is for a 1/8” thick yoga mat ($22) and the large size for a ¼” thick exercise mat ($23). Those of you who enjoy working with the hand spun natural dyed woven cloth to make your own creations will be pleased to know that there are 19 of the fajas ($38) (70” x 5” bands used in Laverne Waddington’s classes), 6 larger weavings ($68) which are 63” x 9.5”, and 12 straps ($18) which are 74” to 78” long and 1.5” wide available for purchase. There are also pillow covers ($27-$35), guitar straps ($25), camera straps ($13), belts ($17), zippered pouches with ($17) and without wrist straps ($16), wallets ($16-$17), ch’uspitas ($17-$25) and 4 gorgeous ch’uspas (traditional shoulder bags at $65). Please e-mail your order inquires to Dorinda at dkdutcher@hotmail.com for item specifics, as each weaving is unique and there are no 2 items alike. Your order will help determine what should be included in the weaving order that will be given to Doña Maxima to distribute between the weavers at the end of this month. The last order to leave Independencia traveled to the U.S. with a former Peace Corps volunteer living with his family in Cochabamba. 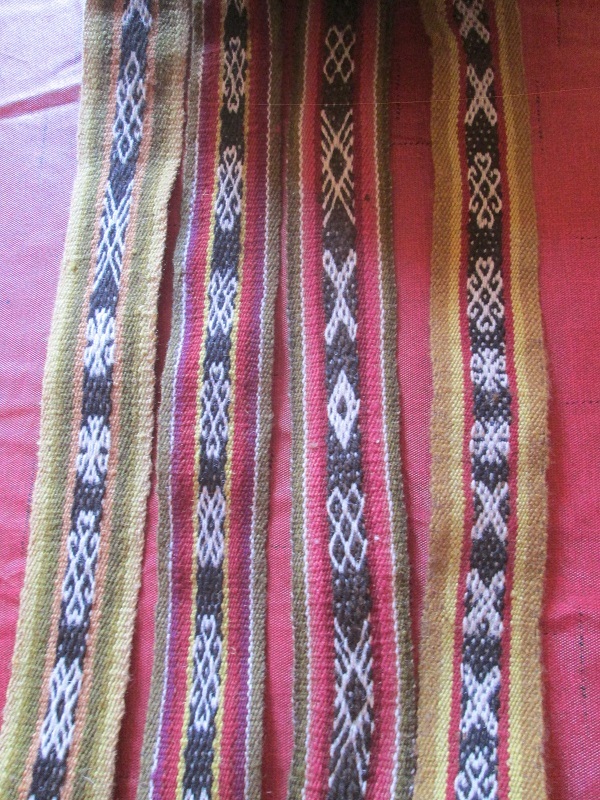 There was a surprise inside the box, and that was the first weaving order, a strap, woven by young Angelica. Angelica’s childhood is not a happy story, and a number of Huancarani weavers had tried to help her learn how to weave so she could earn money for herself and her younger siblings. PAZA gifted dyed skeins well over a year ago to that group effort. She is about 16 years old, with little education, and moved in with her partner’s family some months ago where she is blossoming. 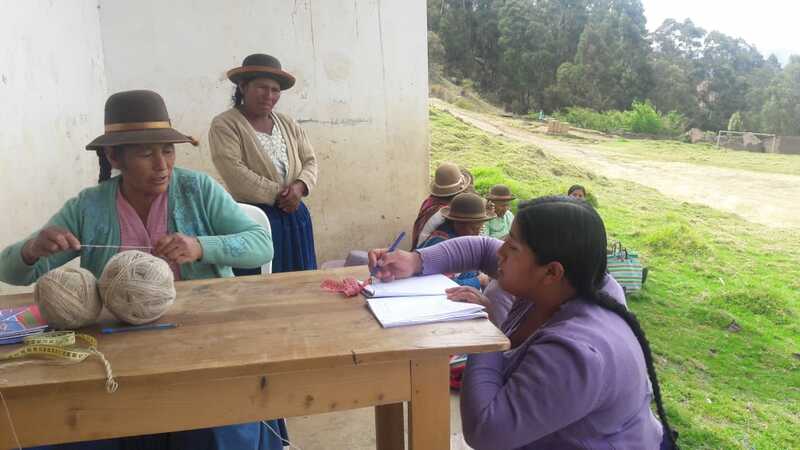 Twenty-one year old Maribel who has made enormous progress as a spinner and a weaver over the past 2 years brought Angelica to the PAZA store in early April and proudly explained the procedure for receiving weaving orders and completing them for payment. That strap in the box signifying a young woman from Huancarani living the farmer subsistence lifestyle had joined the community of weavers who are desperately trying to sustain their weaving tradition and care for their families in a cash economy sums up why PAZA was created in 2008 and why we have to keep this momentum going! Thank you Lyn Lucas for your ongoing support in this time of transition as Doña Maxima takes over full responsibility for the Independencia activities and Dorinda supports the weavers from Bozeman, Montana. This should be the longest stretch between blog postings because PAZA´s long distance working relationship seems to be finding its stride. A hug and thanks to Marian Leishman, Katie Simmons, and Kelsey Wiskirchen who have all helped manage the U.S. based weaving inventory through the years. Thank you Chris Behr for helping out with that last order, and hugs to you and your family. Dorinda Dutcher, July 15, 2018. April was a frenzied bittersweet month for the Club de Artesanas (CdA) members and the weavers of the Centro de Artesanía, Huancarani (CAH). Emotions were held in check by the need for action to vacate PAZA headquarters within 3 weeks. Two dye days and a soap making day were squeezed in as well. Doña Maxima and Doña Antonia wasted no time in locating another space a block away which they had repainted and with the help of Doña Beatris and Vilma turned into CdA´s new workshop/store. The goal is for the space to be used to create products that will sell locally. 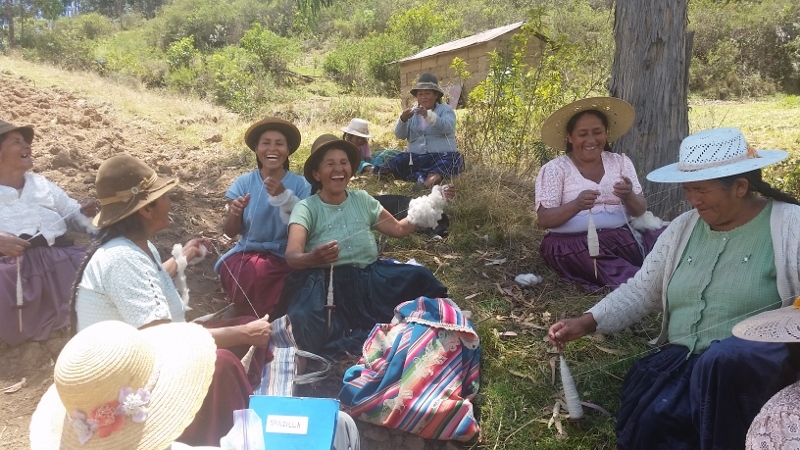 Doña Maxima will hold regular hours two mornings a week so local women wishing to learn how to weave can learn on a drop-by basis. She will continue to open the store on Sunday mornings for the Huancarani weavers. 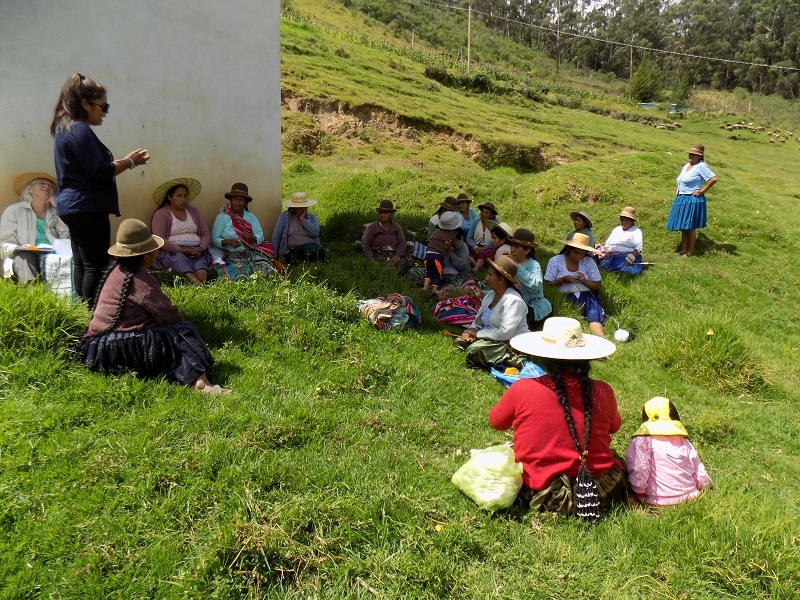 PAZA held a meeting in Huancarani on April 4th to answer questions about the abrupt change in routine with Dorinda moving to the U.S. and Doña Maxima taking on the leadership role. A million thanks to Breny Ugarte who miraculously managed to hitch a ride from Cochabamba to Huancarani in time to facilitate and translate the Spanish to Quechua. There were tears because the weavers haven´t realized that they don´t need constant foreign influence to carry on. Faces brightened as Breny explained the bonus program for master weavers to teach younger women to weave. Each weaver present promised to teach 1 younger weaver. 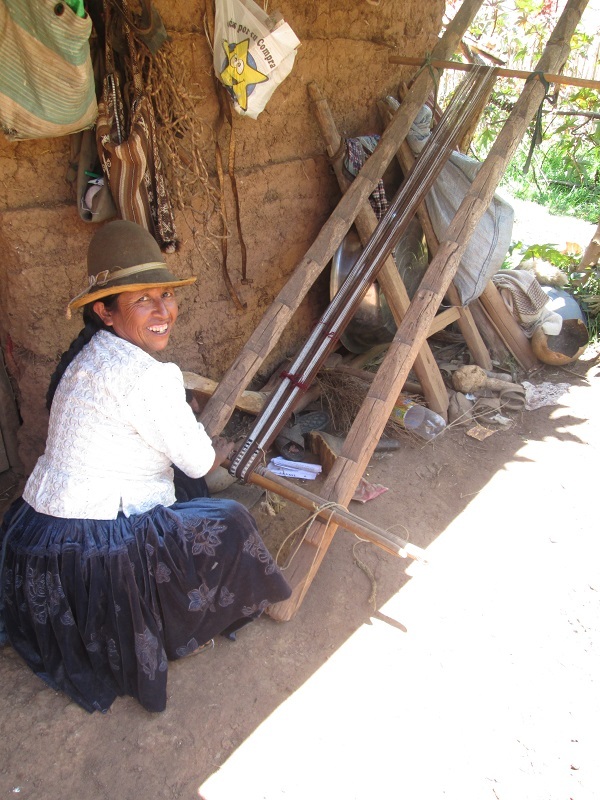 Doña Casimira was so excited she stated that she will not retire from weaving after all and will teach as well. The following Sunday Maribel, who at 21 is the youngest CAH weaver, arrived at the PAZA workshop/store with teen Angelica in tow. 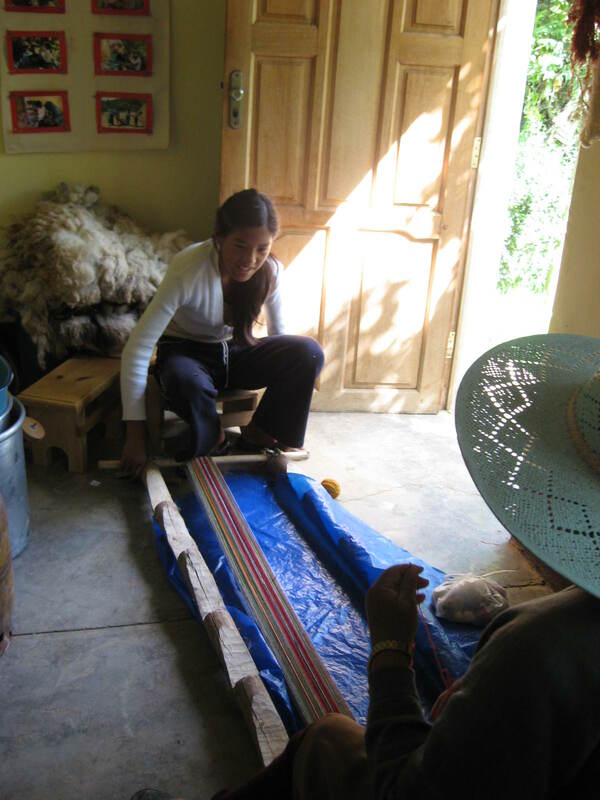 Angelica is the 1st bonus program student and is learning to weave from her partner´s aunt. 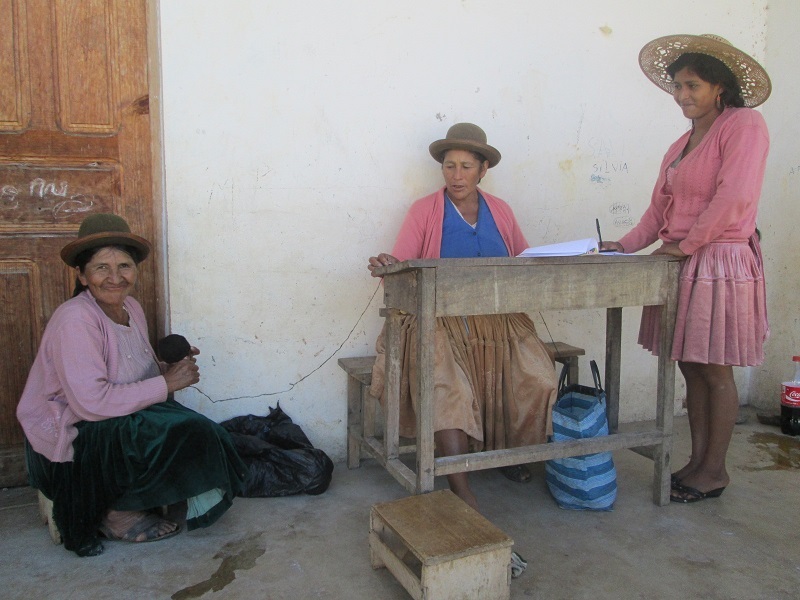 Maribel had brought in a yoga mat strap and wanted to show Angelica how to work with Doña Maxima in turning in a weaving for payment. Maribel left with the CAH file of paperwork in her bag and the responsibility to keep it up to date. Dorinda had fulfilled the Secretary role at the request of past CAH Secretaries who had not had the opportunity to learn to read or write. The CdA women, chicas, kids and past members spent time reminiscing about the volunteers which made taking down the “Volunteer Photo Wall” a fun affair with laughter instead of tears. The photos were fairly divvied up. The cross stitch projects with Rebecca and embroidery work with Surya were mentioned by all of the chicas. Emily broke out in song with the chorus of “La Cucaracha” that she had learned from José a volunteer from Mexico. Stories of Amanda´s 5 years of jewelry making workshops were shared between the women, chicas, and kids. Emily and Linneth took home the puppet making materials from Profesora Judy´s class. Although much of the CdA equipment and supplies went to the new workshop, some was divided between CdA members. Veronica and Nelva each took home one of the portable sewing machines. Of the 5 original CdA chicas, 2 of them are making a living by sewing. They learned at school but used the CdA sewing machines on a regular basis to make their own clothes. 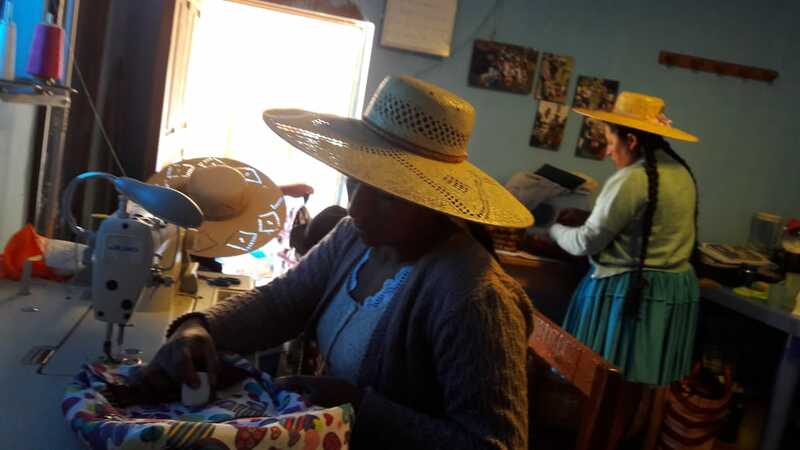 Reyna, who spent her senior high school year as the trainer for the CdA chicas is loving life and sewing for a company in Argentina. Lizeth, who wandered away from the Club her junior year and migrated to the city after graduation put in an appearance at the CdA workshop for the first time in 4 years and said, “I am buying an industrial sewing machine so I can work at home, I learned so much here, thank you.” Gabriela, who is studying hair styling in the city, was a CdA chica trainer her senior year. She dropped by for a plier set so she could combine jewelry making techniques she learned from Amanda, founder of Ruraq Maki, with hair adornments she learned how to make from volunteer Michelle Burdette in 2015. The word “democratica” was used many times as the chicas divvied up jewelry making and art supplies. Jhesica received the silkscreening supplies donated by volunteer Surya and the hair adornment supplies. Being cousins and neighbors, she and Nelva worked out an arrangement for sharing Nelva´s sewing machine. 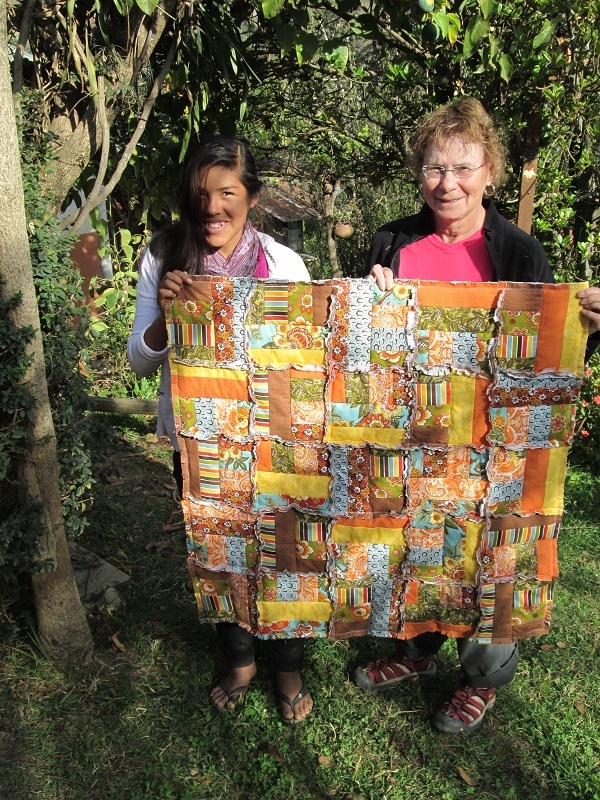 Dorinda and Doña Maxima´s will be shopping in Cochabamba next week for a new portable sewing machine for the workshop. The biblioteca (library) was PAZA´s pride and joy. Many of the books had been purchased or donated by the Peace Corps when the Bolivia program closed in 2008. Because the majority of the books were in English concerning development project themes 4 heavy bags and 2 box loads were lugged back to Cochabamba to a former Peace Corps volunteer who works for a youth service learning program and who also has ties to Biblioworks in Sucre. Many children´s books written in Spanish had been donated through the years. Some of those books went to the new workshop and some were divided between the CdA kids whose interest in reading has been sparked by those books. May ownership encourage them to continue to open book covers and disappear into the tales within. 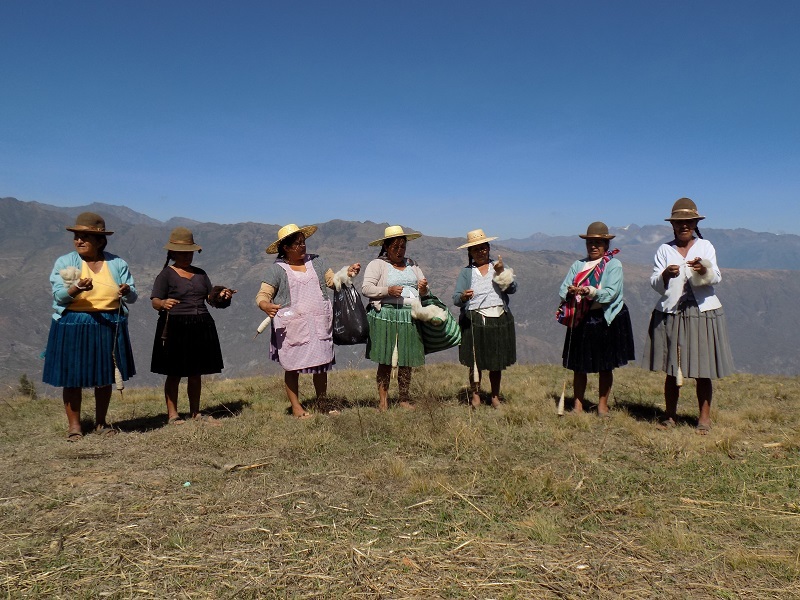 Preservation of their weaving tradition weighs heavy on Doña Máxima and the Huancarani weavers. Many of the ageing weavers taught their daughters as they were taught but only 2 have daughters who live in the area and weave today. The educated youth of the past few generations have fled to the cities upon graduation of high school to pursue more options in life then the brutally physical farmer subsistence lifestyle. 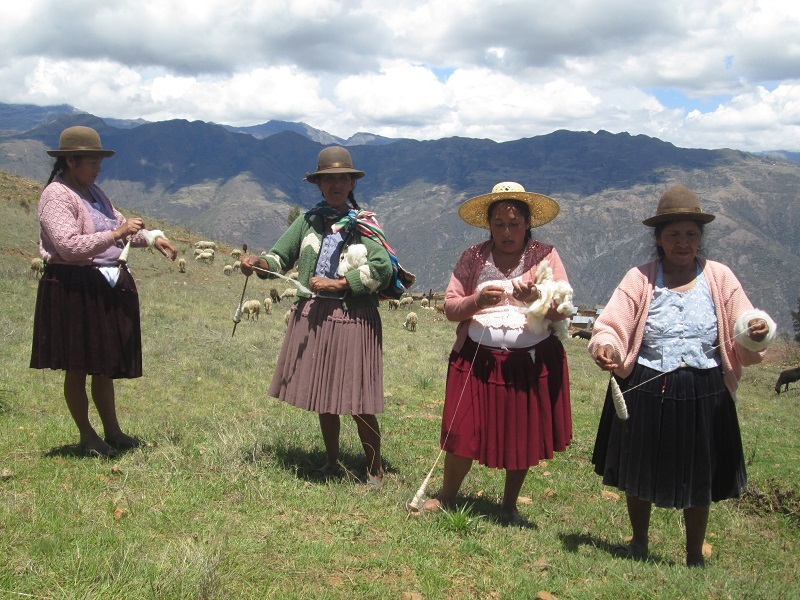 When PAZA began the Club de Chicas in 2010 the goal was to teach teens to weave. 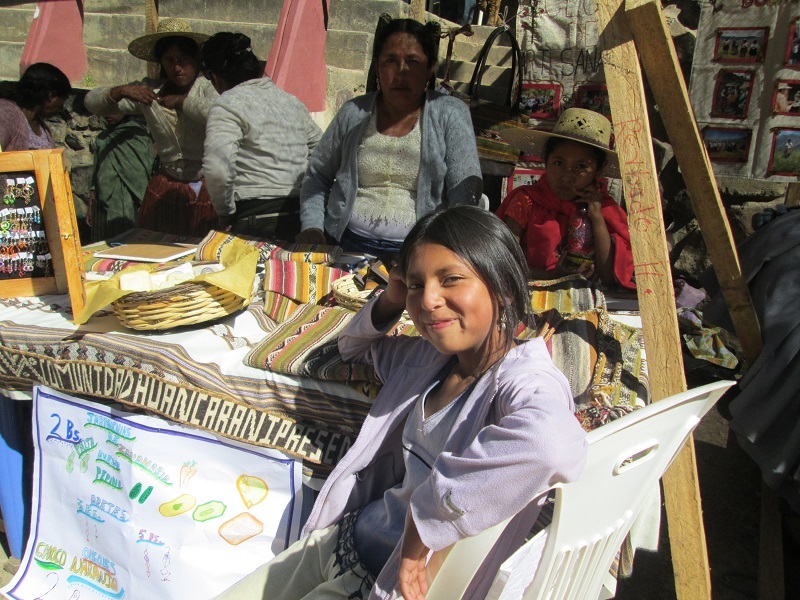 PAZA was selling at craft fairs in Cochabamba three times a year and the teens were motivated to weave to sell. None pursued the craft after high school graduation. 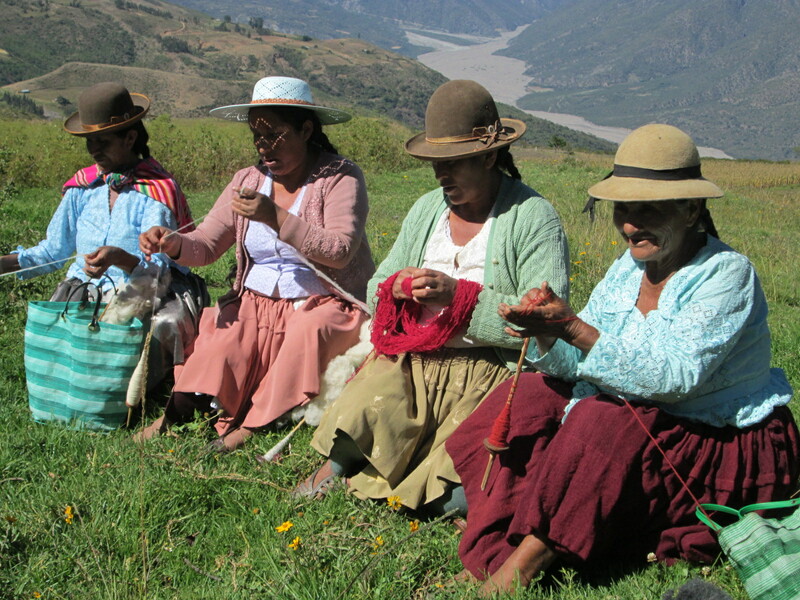 The current chicas in the Club don´t even pretend to have an interest in learning to weave. 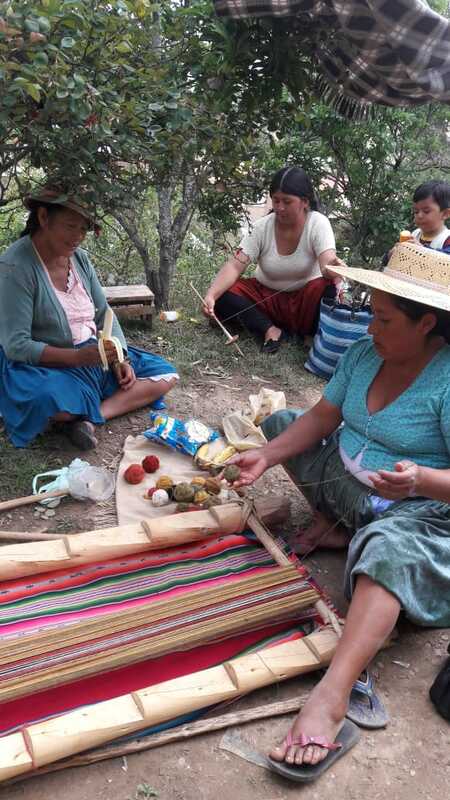 Although many fiber arts and other skills have been taught by volunteers and visitors through the years to Club members and the weavers of Huancarani, the preservation of the weaving tradition remains one of PAZA´s 3 main objectives. 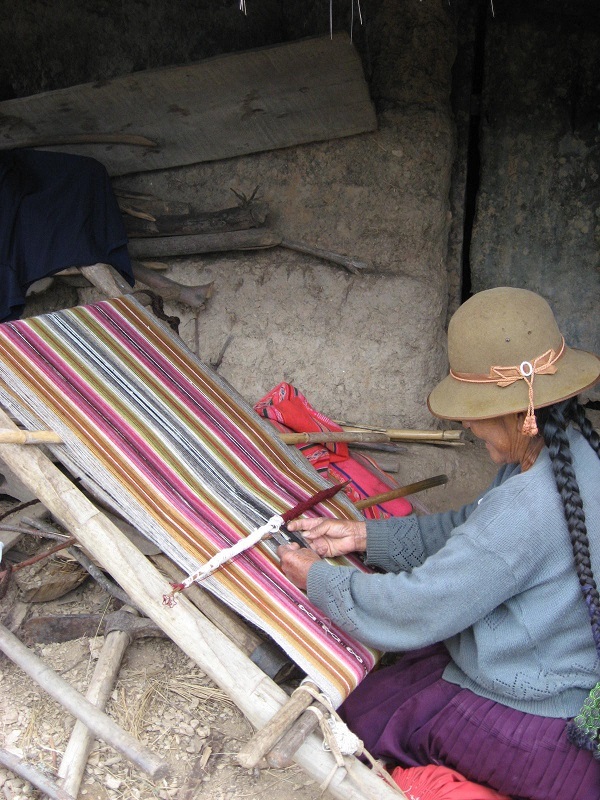 Preserving the weaving tradition is reaching a critical point. 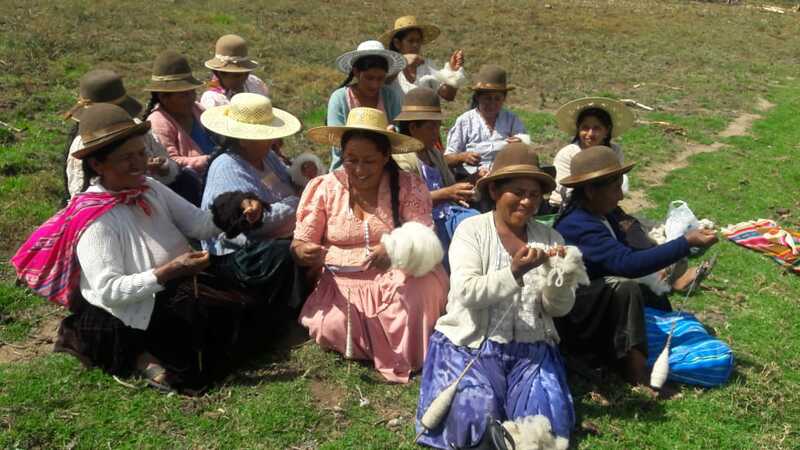 Last month Doña Casimira, formerly a prolific weaver, declined an order confessing that she is no longer up to the physical demands of weaving. All is not lost! Doña Maxima has been approached by young mothers moving into the new neighborhoods springing up in Independencia who want to learn how to weave. The women are so young, semi-literate, de pollera (traditional skirt), and desperate for a means to earn an income to care for their kids. They have moved from their farms to a town that can offer them no work. Doña Casimira may not be able to weave but she can teach and pass on her wealth of knowledge. PAZA is going to test a bonus program to encourage the master weavers to teach the young women. There will be a bonus paid to each master weaver who works with a younger woman to the point where the new weaver meets the required quality for the yoga mat straps. The Club de Artesanas is going to undergo major changes to get back to its objective of helping the ageing weavers preserve their textile tradition. The current teen program will end on April 6th. 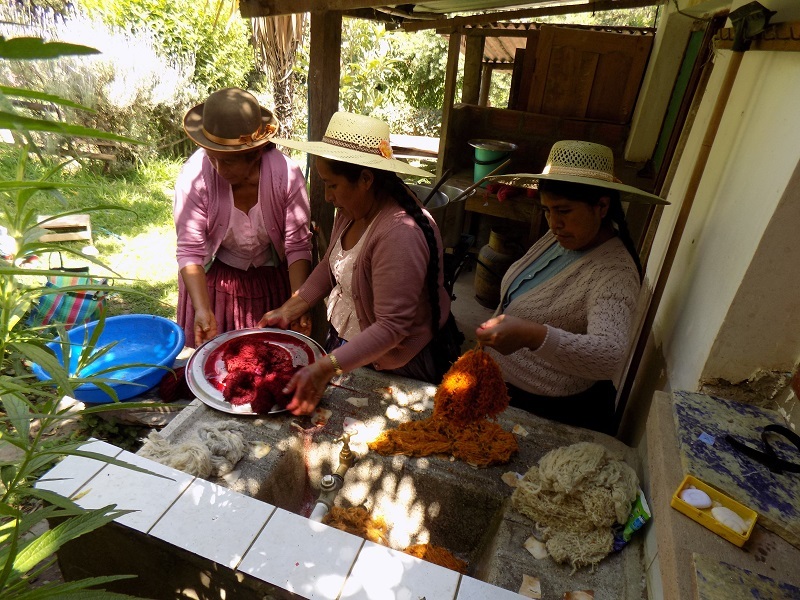 The future changes will be 100% in the hands of Doña Maxima and the 3 remaining core members who are all weavers. 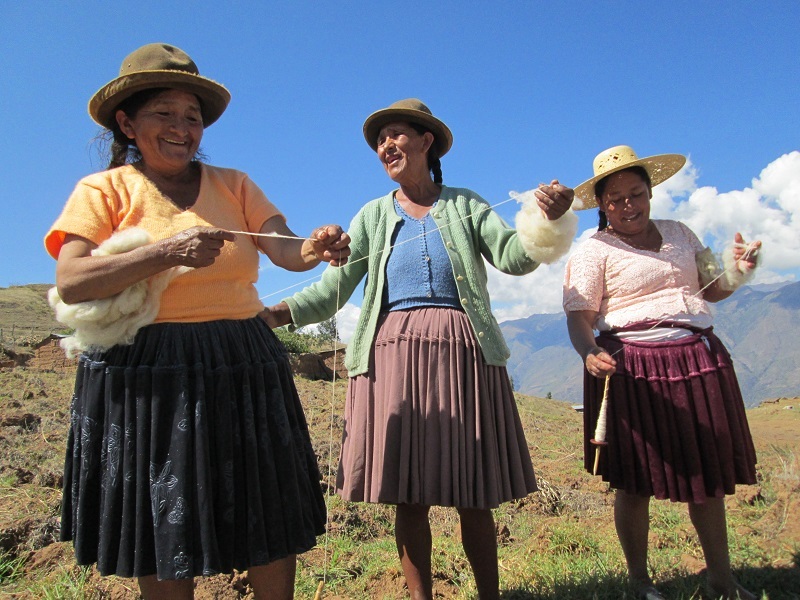 They will divide their time between teaching weaving and working on a new product line of fiber arts products other than the traditional weavings that can be sold locally. If they lead, others will follow. PAZA will continue to pay rent for workshop space evaluating regularly to be able to phase out as the entrepreneurial efforts of the women allow. The space is important because it is also a gathering place/refuge where the women can meet to talk, laugh, support each other, and cry. Doña Maxima will take over management and ownership of the equipment and supplies. Her wage will be reduced to 2 half days in part because the young mothers wanting to learn to weave can’t devote whole days or even whole mornings to attending. The wage reduction is also a compromise between motivation to spark her entrepreneurial streak and to keep the momentum going.